Web Design Singapore has set a very high standard in the domain of website design. I was quite impressed by their ability to picture my needs and requests after only a couple hours of meeting, and I was pleased by the right touch of creativity they added to their professional work. As a result, our website is even better than I expected. Web Design Singapore dedicated a lot of energy in guiding me through the process of web design, and as a novice in the field I learnt a lot while working with them. They definitely know how to combine quality and reliability, and even after completion I can count on their friendly support. I highly recommend Web Design Singapore. After working with many web designers in Singapore, we chose Web Design Singapore to revamp our website as Web Design Singapore had a better portfolio, having more projects completed and their customers were middle sized companies above. The project manager of Web Design Singapore gave us a good impression and he could convince us that their designing work for our website would be excellent. And it is. Their after-sales service is also fantastic. I am often around their cozy office after work hours, talking with the team about any issues with our site management that needs their help. We don¹t have our own dedicated web-master guy so their help after the hand-over is extremely important for us to maintain a good website for our hundreds of members access around the region. We really appreciate that. We wish Web Design Singapore, the project manager and his team every success in their career. We engaged Web Design Singapore to revamp and enhance the security of our company website. We didn’t have any raw file or document for WDS to retrieve and understand. But they didn’t charge us any additional cost and continued to build our website from scratch with a similar outlook but improved backend (CMS). They suggested alot of ways to improve our website security and never failed to provide us with feedbacks and recommendations to make our website better and easier to manage. 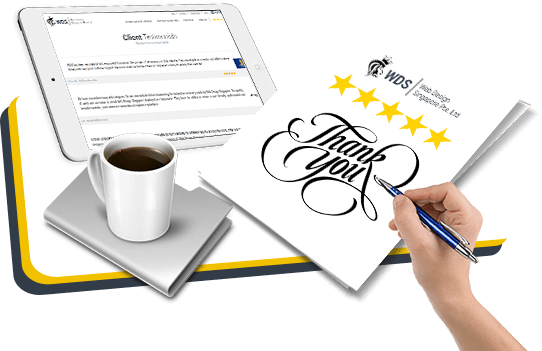 We will strongly recommend WDS to all our friends out there for their professional attitude and patience towards customer requests. After this project we have already engaged WDS to design another website for our company, and in the future if we have any additional websites to upgrade or design, WDS will be our first choice. WDS had been very helpful and efficient in helping us to revamp our website. We are very satisfied with their prompt response. We have quite a lot of stuffs to changed and sometimes when we are not satisfied with the job done, WDS is very patient at changing it time and again for us. We would like to thank them for their great efforts and patience. Definitely will recommend to others! I chose Web Design Singapore for all my company designing as I had heard about their outstanding reputation from my contacts. I have a nutrition company and was looking for support to express exactly what my company encompasses. Web Design Singapore came up with an overall theme for my company and designed my website, business cards, leaflets and stationary that was very accurate to what I wanted to express through my products and services. They gave great insight into design, marketing, specific industry needs and consumer attractions. I was also really impressed with the great professional and personal balance the management has and the effort that Web Design Singapore made to help me create the exact message for my company. Web Design Singapore is flexible, delivers on time and affordable. I recommend Web Design Singapore, its services and the management without hesitation. I engaged Web Design Singapore to build me a completely new website for my floral design business – from scratch. At first I was a reluctant customer as it was hard for me to let go and I’m very particular about content, colours and the whole image. I had always created and managed my own sites. I’m very pleased I came to my senses and handed it over to the professionals. I found Web Design Singapore to be efficient, professional and caring and am so pleased that I engaged their services. I can highly recommend Web Design Singapore and for those still unsure – it was money very well spent! I would really like to say a big THANK YOU to team Web Design Singapore (WDS)! When I decided to revamp The Cookies Factory’s website, I called up many different vendors, but WDS was the only one to get back to me quickly and give me a detailed description as per my request. From planning to executing my website, WDS showed a tremendous amount of patience and professionalism. They truly contributed great ideas on improving my website and the final product I received garnered many positive feedbacks from my clients. They are definitely a top-notch web design company!